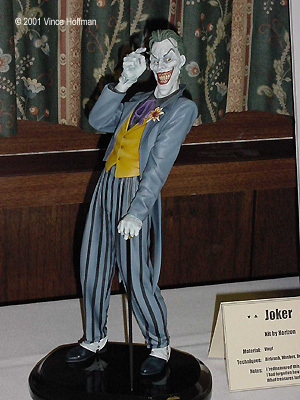 Show report from Wonderfest 2001 . Image: Dave "Blappy" Gueterin drove all the way from Ontario, Canada to enjoy the hotel's breakfast. 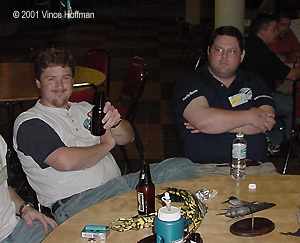 Image: Chris Doll (center) explains all. 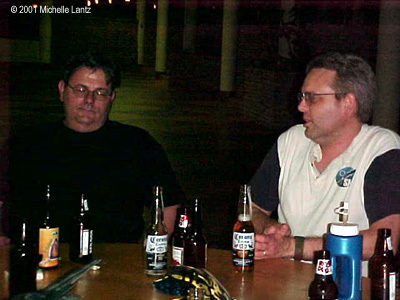 Image: Don Matthys (left) and John Lester (no, that's not all our beer). 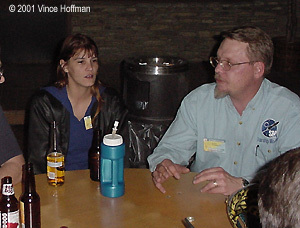 Image: Raiding the vendors room: Joe Brown, Vince Hoffman, and Erin Lantz. 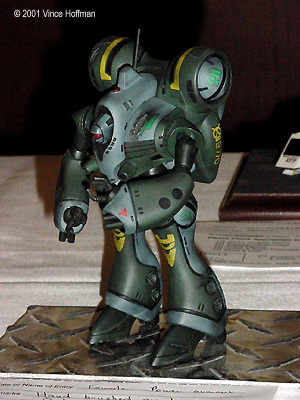 Image: Federation Models had a huge collection of models and detail sets, including Starcraft's new Sabre. 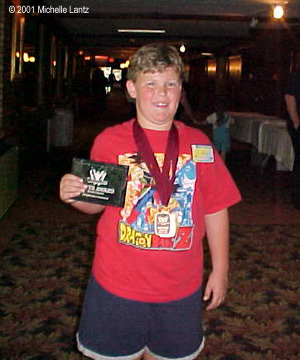 Image: Ben E. cleaned up in the Juniors category. 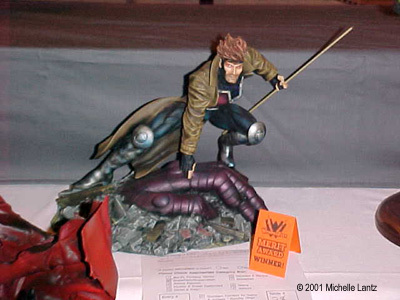 Wonderfest, held every year in the late spring in Louisville, KY, is considered by many to be the premiere sci-fi and fantasy model show in the US. 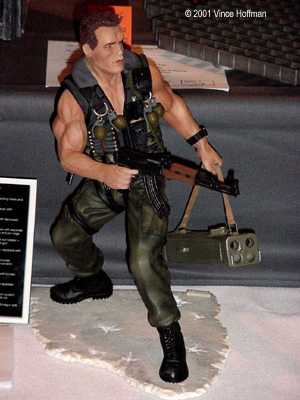 Each year for the past decade, Lee Staton and crew have been putting on a fantastic convention that draws people from around the world to talk, eat, sleep, and dream models for three days. And it's a sci-fi dream come true - where airplanes, tanks and cars are marginalized and sci-fi geeks rule! The modeling demos were back again as well. Eleven half-hour presentations by regular modelers on various topics and techniques were held over the two days. 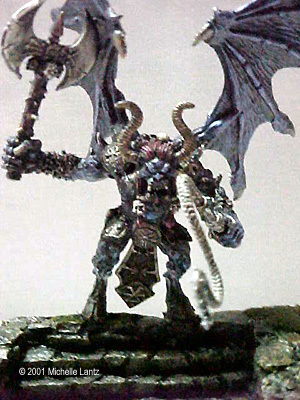 Subjects ranged from Basic Resin Casting to Lighting to How to Photograph Models. Each session was packed, and most could have gone on much longer than the time allotted. These are well worth attending - and hopefully will be expanded next year. Attendance was the highest ever - over 3000 people - and the contest was correspondingly large, with a record 396 entries. 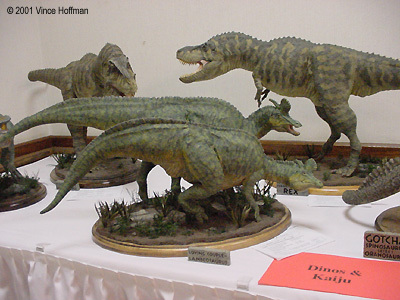 This year, Vehicles and Mechs jad their own room, as did Dinosaurs/Kaiju (Japanese Monsters), Dioramas and the "Adult" entries. 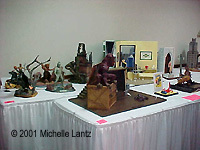 Figures (plus Anime, Humour and Superheroes) spread out to cover the two rooms that held all the entries barely two years ago. For a complete list of winners, please click here. 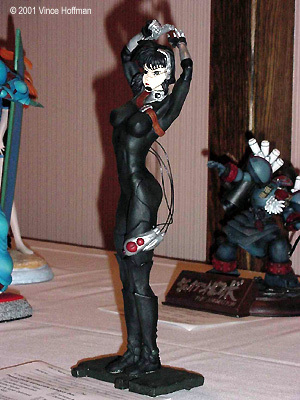 If 13.5MB isn't enough images, you can always take a look at the Wonderfest site and CultTVMan's Wonderfest Report. Some of the writing on the entry cards was hard to decipher. If I've spelled your name wrong or mis-identified your model, please contact me to get it corrected! 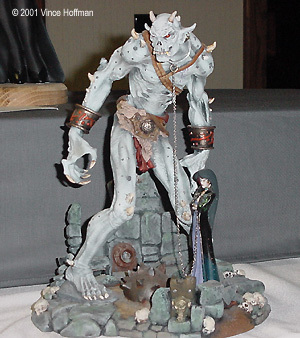 Image: Scratchbuilt "Ladybug" figure, from an unpublished novel. Image: Godzilla in Hudson City won a Gold and "Most Amazing Figure"
Seven modelers (Erin Lantz, Vince Hoffman, Chris Lynch, Terry Miesle, Mark Yungblut, Larry Strickland and John Lester) got together after last year's Wonderfest and started a group project: a large diorama depicting mechs fighting in an urban area. 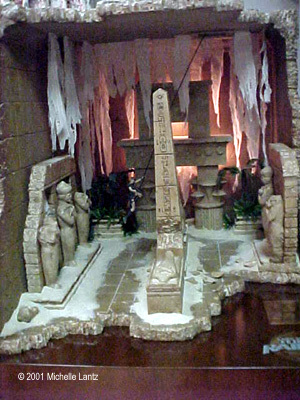 Eight separate scenes, judged separately, made up the display. It was a fun project, and a great learning experience - well worth the effort. Read Erin's description. 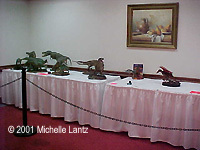 Image: The overall display covered one whole table. 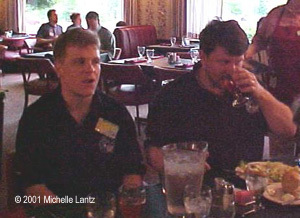 Image: Erin's portion had the most action, and won a Merit award. 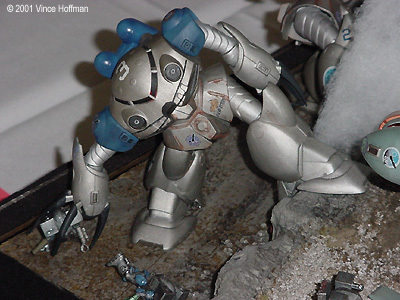 Image: Amphibious mechs climb the seawall. 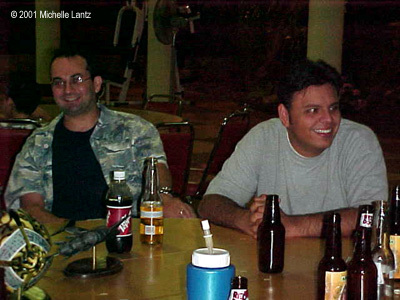 Image: These guys are from the 'Rabid Otters' - don't ask. Image: Vince's reinforcements pass a group of soldiers playing cards in the rubble. Image: My (John's) first square shows two mechs still fighting after the ammo ran out. Image: ... one of whom gets too close to a can opener. Image: It weighs 50 tons - why bother with camouflage? 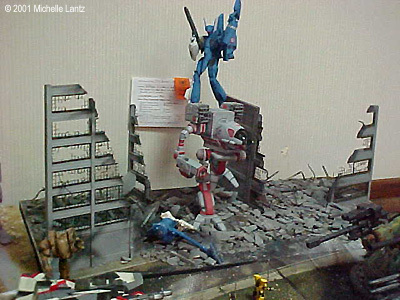 Image: Trying to kill the tank are my mechs, the Griffon using a ruined command post as a bunker. 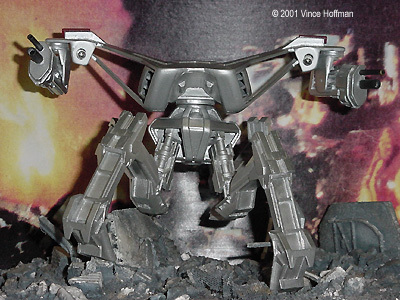 Image: These roughly-handled light mechs are no match for the tank. Image: Dan Thompson's HMS Wasp took a Merit award. 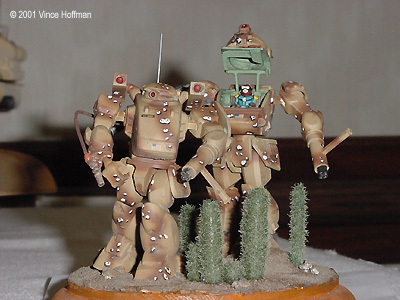 Image: Erin Lantz's Gundams (the Heavy Arms on the left was a Merit winner). 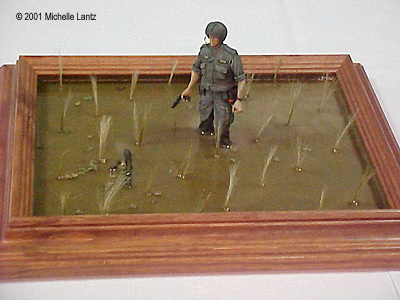 Image: Erin's "Army of Two" also won a Merit. 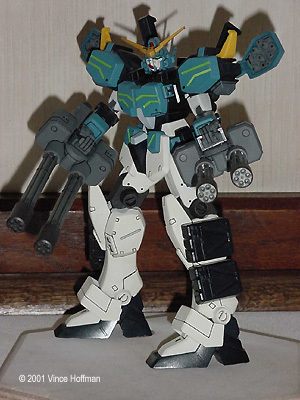 Image: Erin's Heavy Arms Custom. Image: ... as did Bob Hickl's 44" Eagle. Image: Discovery. Tom's Clark's Merit-winning SF3D Snake Eye (yellow and grey SAFS mod), Jovian Chronicles Syreen, and LoGH Battleship are in front. 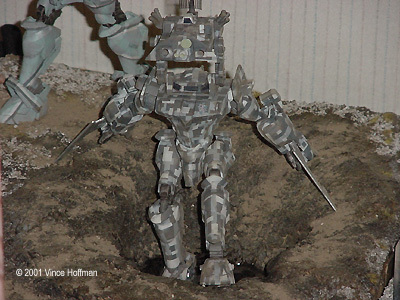 Image: Clark Honschke's scratchbuilt Pit Droid Prototype won a Silver. 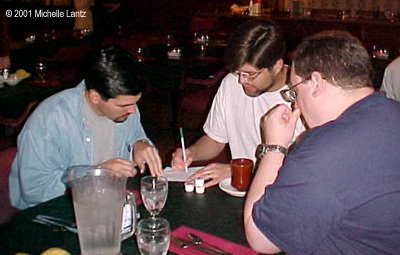 Image: Dave's second Enterprise-D . 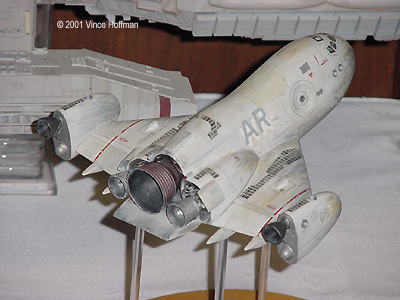 Image: Dave also had a Federation Dreadnaught based on the large ERTL kit. Image: Another look at the Dreadnaught. 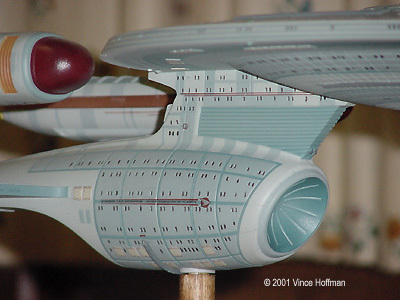 Image: Close-up of the Enterprise-C. Image: All five Evangelion types. Image: with a tiny Delta Flyer. 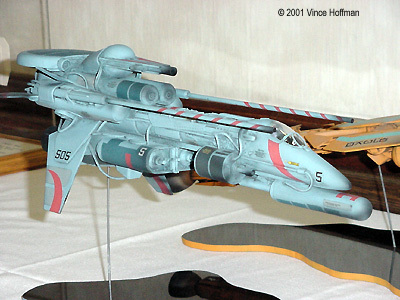 Image: Kitbash based on the Voyager, the USS USS Li Mu Bai. Image: James Bond's Little Nellie. 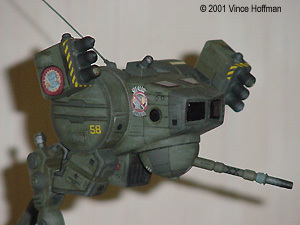 Image: Joe Graziano's Merit-winning, scratchbuilt Hover Tank I. Image: John Creed's SF3D Fliege (left) won a Gold, and the Gustav - Ambush Pattern (right) a Silver. 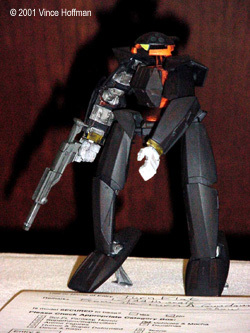 Image: Closer look at the Gustav. 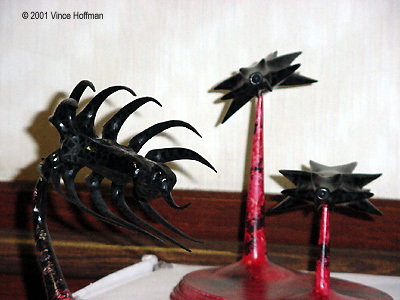 Image: Erin Lantz's "Thirdspace" Flower fighter (left) and someone else's Madcat. Image: John Larson's "Forever War" transport. 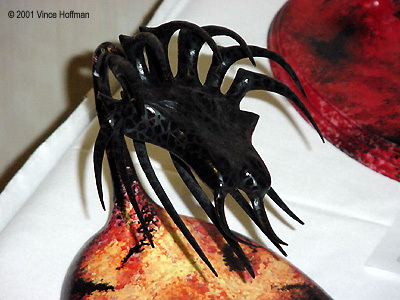 Image: Evelio Mora's "Flying Chamber Pot - Fireball S.G." won a Silver. 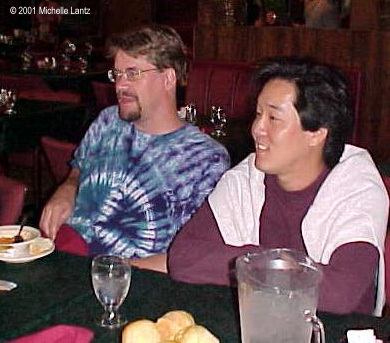 Image: John Lester's (unfinished) "Iron Chef". 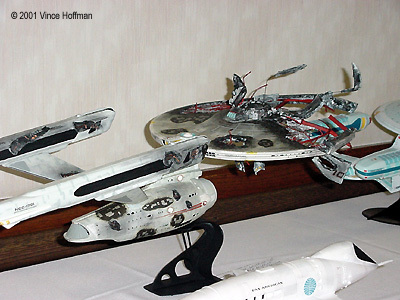 Image: USS Jaunt - a really neat idea. Image: The Jaunt, all lit up. 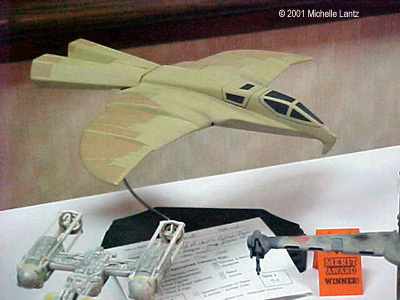 Image: Joe Brown's scratchbuilt "WarHawk" fighter won a Merit. Image: One of John Douglass' kitbashed ships (green). Image: Another look at the grey ship. Image: John's third entry - bright orange. 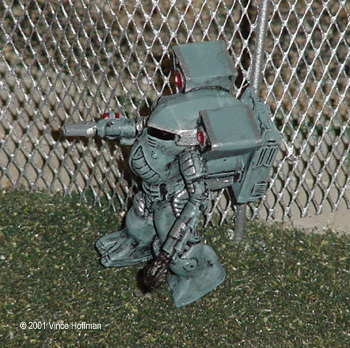 Image: John Funk's scratchbuilt Centurian Hunter Killer Tank won a Merit. Image: ... and his Spaceplane. Image: More entries (Joe brown's are in back). 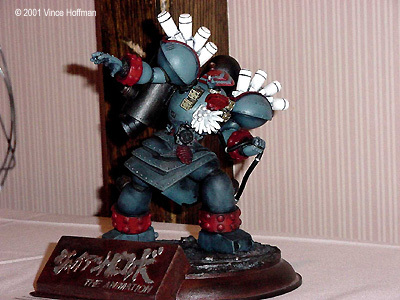 Image: John Sowinski's Martian War Machine won a Bronze. 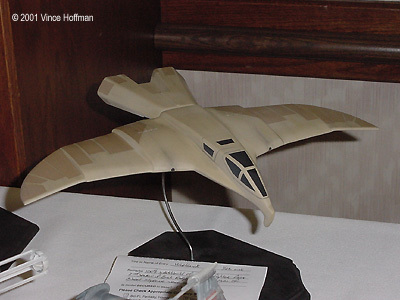 Image: One of several Klingon Birds of Prey. Mike Starling's won a Silver. 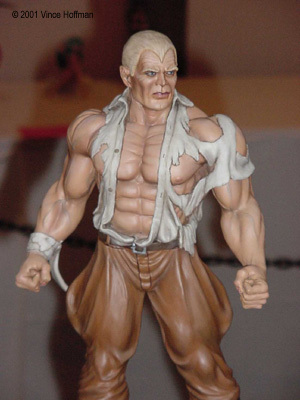 Image: Shane DeBoice's Kobu-kai won a MErit. Image: Leif Ericson Explorer missing the "engine" modules and a little thingy that went on the front. Image: Leelan Lampkin's Shadow Scout won a Merit. Image: Another look at the Scout and the Fighters. 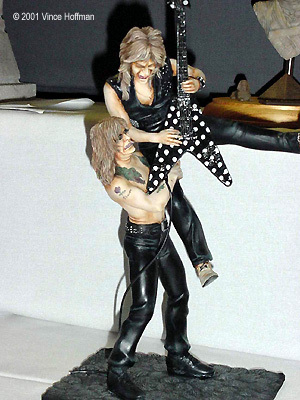 Image: Mark Yungblut's Locust took a Bronze. Image: A closer look at the Locust. 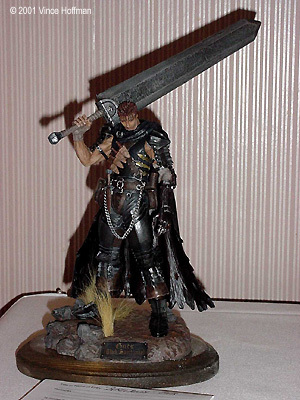 Image: Chris Doll's INSS MacArthur won a Merit. 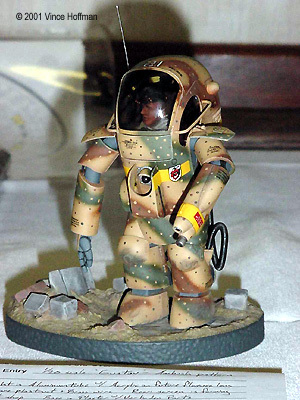 Image: Terry Miesle's Vorlon Transport miniature. 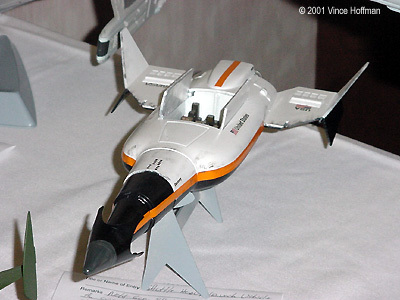 Image: Marc King's scratchbuilt Speedboat Shuttle. Image: Still more wholesome modeling goodness. 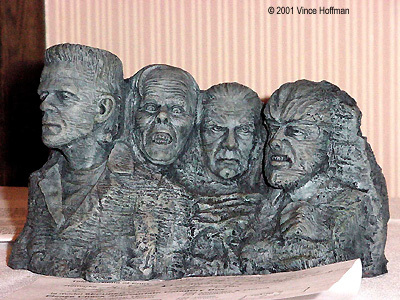 Image: Michael Walker's Phaser Collection took home a Gold. 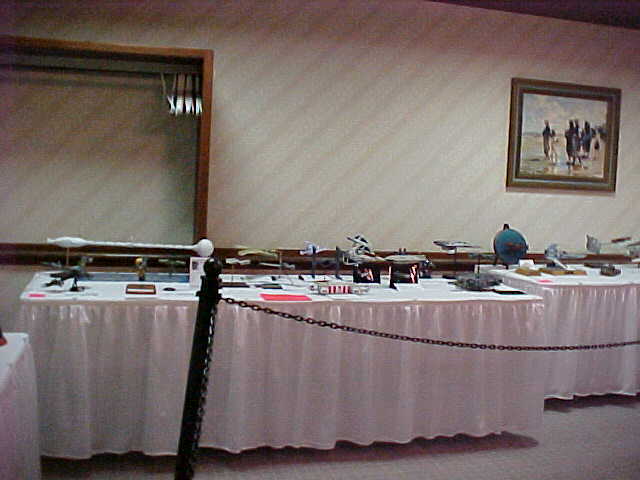 Image: Entries - Joe Brown's TIE Defender, Peter Fay's Merit-winning AMX-1105 Zaku III and John Funk's Y-Wing and Rebel Transport are in this shot. Image: Mark Honschke's Silver-winning Earthworm Jim Handgun. 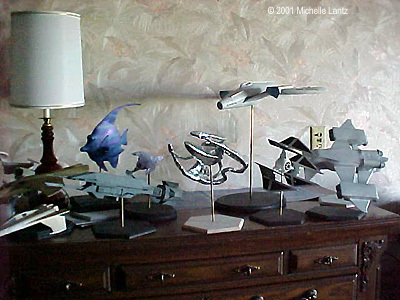 Image: Several kitbashes based on Seaquest models. 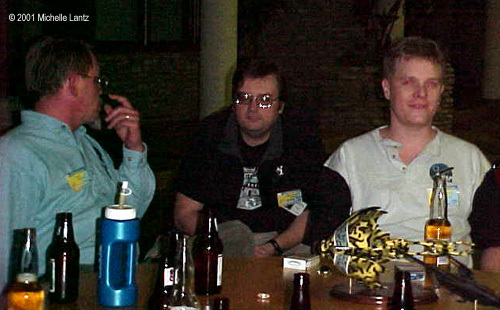 Image: Sinclair's Starfury earned a Merit for Tony Wootson. 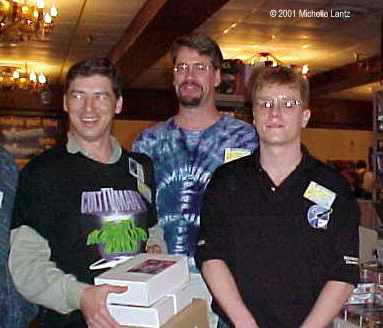 Image: John Funk's Dark Planet Mining Shuttle (foreground) won a Merit. Image: Steve Parady's Crimson Viper is in the back row here. Image: More entries. Image: Star Trek ships dominate this shot. 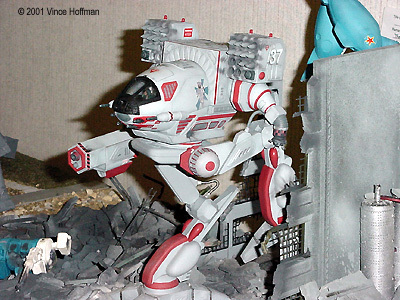 Image: Terry Miesle's Jet Speederbike. Image: .. and a modified one. Image: Closer look at the black one. 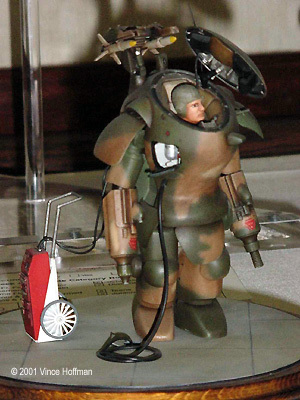 Image: Vince Hoffman's Super Armored Fighting Suit won a Bronze. 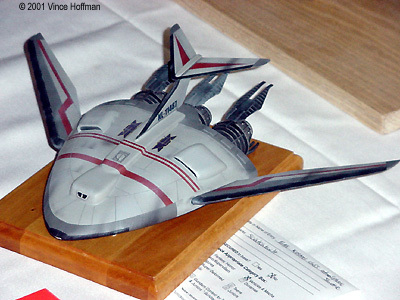 Image: Vince's Kestrel shuttle won a Merit. 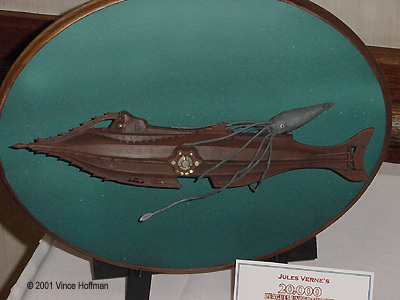 Image: Eddie Combs' Vorlon Transport won a Silver. Image: He'll be back, Mr. Predator - a Gold Winner for Randy VanDyke. Image: Batgirl Adventures #1 - a Gold winner for Henry Lambracht, Jr. 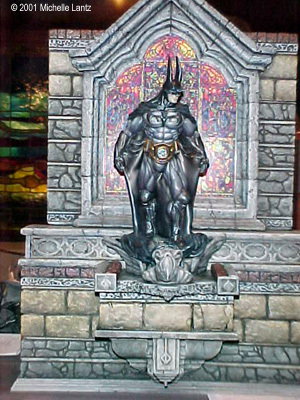 Image: Captain America gets medieval on the Skull (toyBiz kit?). 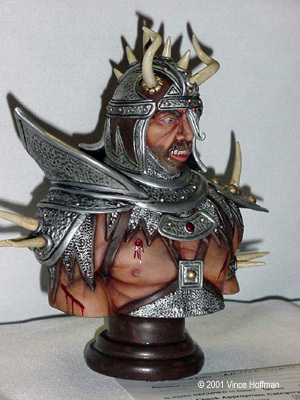 Image: ...or this guy in your hall closet. Image: Lil green man with an attitude. Image: Kirk and Troi by Richard Gaskill. 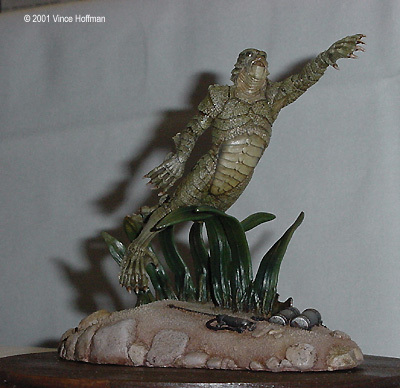 Image: Creature from the Black Lagoon. 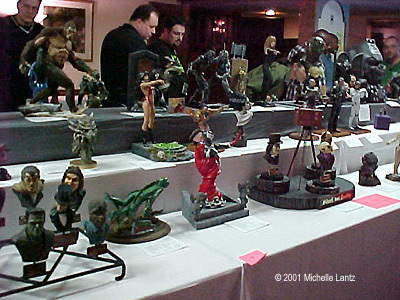 Image: The figures categories filled two rooms full of models. Image: Momma warned me about girls like her. 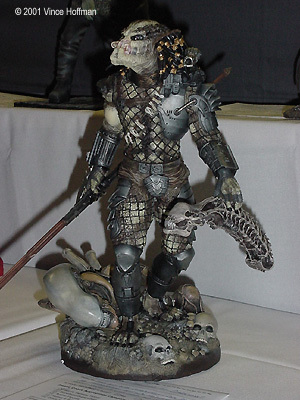 Image: Predator won Daniel Tarr a Bronze. Image: Professor Gremlin dominates this table. Image: Rock me, Dr. Zeus! 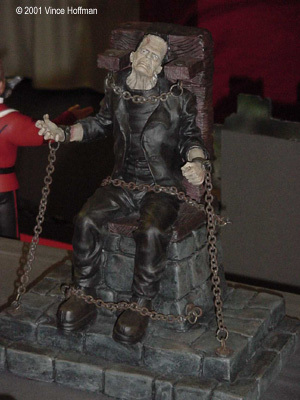 Image: Frankie in chains - a Merit award winner for Edward Bagwell. Image: Gambet - a Merit award for Juan Guzman. Image: Clif Dopson's "Gotham Sunday Morning" won a Gold. Image: Boba Fett riding a war-chicken. 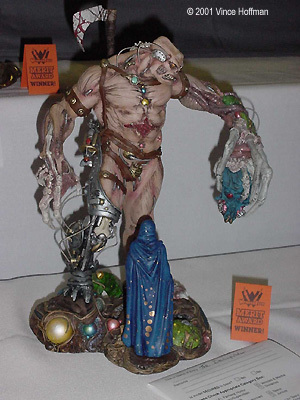 Image: Howard Kellogg's big "Mother Superior" won a Silver. Image: Is this a girl's best friend? Image: Or is it this one? 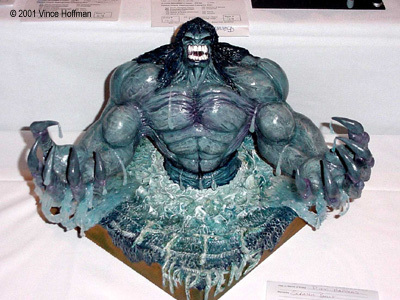 Image: "Spawn", by Joe Goad, won a Silver. Image: Andy Price's Silver-winning "Supergirl". 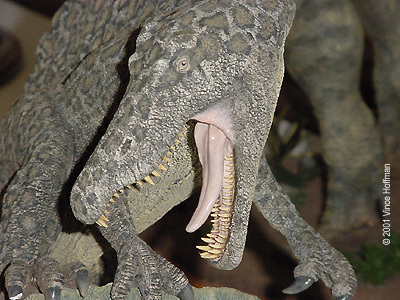 Image: Dunno what it is, but it's scary. Image: Lum (left) and another pretty gal. Image: Matthew Walker's Merit-winning Asuka on the beach. 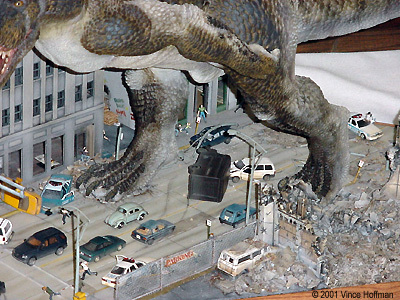 Image: Godzilla fighting Megaguirus -- the villian from Godzilla: 2000. Image: Kyler Ogden's "Mach 5" and "Mystery Machine" won Merits in the 12 and Under category. 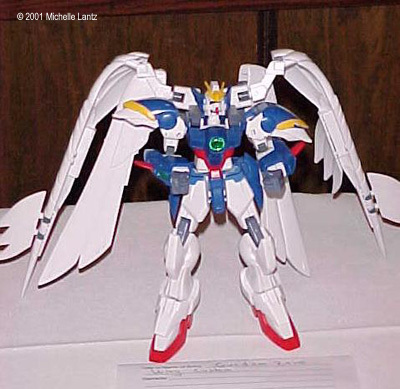 Image: Looks like "Dark Angel", a bit. 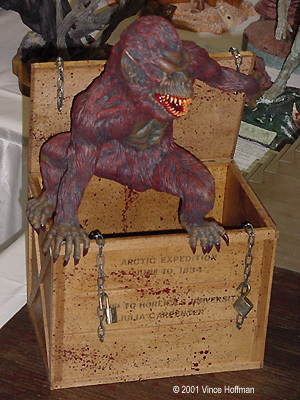 Image: Ben Mohr's "Gremlin" (Merit) and Henry Lambracht III "Angry Eva" (Bronze). Image: Joe Brown's "Trojan Fish" woon a Merit award in the Humor category. 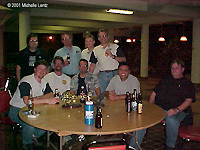 Last updated on 10 October 2001.